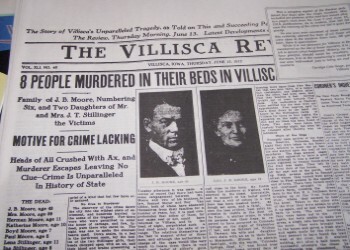 The Villisca Axe Murders occurred between the evening of June 9, 1912, and early morning of June 10, 1912, in the town of Villisca in southwestern Iowa. 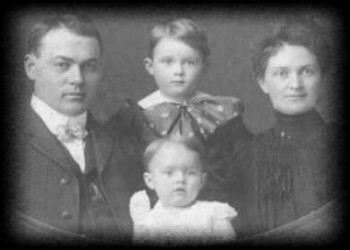 The six members of the Moore family and two house guests were found bludgeoned in the Moore residence. All eight victims, including six children, had severe head wounds from an axe. A lengthy investigation yielded several suspects, one of whom was tried twice and acquitted. The crime remains unsolved. Once the murderers were discovered, the news traveled quickly in the small town. As neighbors and curious onlookers converged on the house, law enforcement officials quickly lost control of the crime scene. It is said that up to a hundred people traipsed through the house gawking at the bodies before the Villisca National Guard finally arrived around noon to cordon off the area and secure the home. Eight people had been bludgeoned to death, presumably with an axe left at the crime scene. It appeared all had been asleep at the time of the murders. Doctors estimated time of death as somewhere shortly after midnight. Curtains were drawn on all of the windows in the house except two, which did not have curtains. Those windows were covered with clothing belonging to the Moore's. 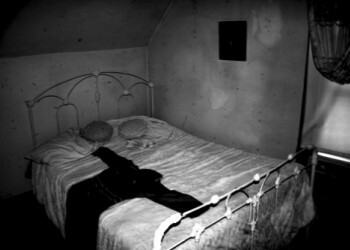 All of the victims faces were covered with the bedclothes after they were killed. A kerosene lamp was found at the foot of the bed of Josiah and Sarah. The chimney was off and the wick had been turned back. The chimney was found under the dresser. A similar lamp was found at the foot of the bed of the Stillinger girls, the chimney was also off. The axe was found in the room occupied by the Stillinger girls. It was bloody but an attempt had been made to wipe it off. The axe belonged to Josiah Moore. The ceilings in the parent's bedroom and the children's room showed gouge marks apparently made by the upswing of the axe. A piece of a keychain was found on the floor in the downstairs bedroom. A pan of bloody water was discovered on the kitchen table as well as a plate of uneaten food. The bodies of Lena and Ina Stillinger were found in the downstairs bedroom off the parlor. Ina was sleeping closest to the wall with Lena on her right side. A gray coat covered her face. Lena, according to the inquest testimony of Dr. F.S. Williams, "lay as though she had kicked one foot out of her bed sideways, with one hand up under the pillow on her right side, half sideways, not clear over but just a little. Apparently she had been struck in the head and squirmed down in the bed, perhaps one-third of the way." Lena's nightgown was slid up and she was wearing no undergarments. There was a bloodstain on the inside of her right knee and what the doctors assumed was a defensive wound on her arm. Dr. Linquist, the coroner, reported a slab of bacon on the floor in the downstairs bedroom lying near the axe. Weighing nearly 2 pounds, it was wrapped in what he though may be a dishtowel. A second slab of bacon about the same size was found in the icebox. Linquist also made note of one of Sarah's shoes which he found on Josiah's side of the bed. The shoe was found on it's side, however it had blood inside as well as under it. It was Linquist's assumption that the shoe had been upright when Josiah was first struck and that blood ran off the bed into the shoe. He believed the killer later returned to the bed to inflict additional blows and subsequently knocked the shoe over. In 1994, Darwin and Martha Linn of Corning, Iowa purchased the former home of murder victim J.B. Moore and his family. The house was returned to it's original condition at the time of the murders on June 10th, 1912. It was listed on the National Registrar of Historic Places and opened for tours. Films and books on the murders have recently captured the interest of an audience who had never heard of this horrendous crime. Psychics claim they've identified the murderer and history buffs continue collecting piles of documents they say point to the truth. In all honesty though, we will never really know what happened on that dark night inside the home of J.B. and Sarah Moore. The murderer or murderers were never caught and given the many years that have passed, their dark secret was obviously carried with them to their own graves. For some, the speculation was almost too much to bear and in 1912, townspeople began to distinguish and identify themselves by who they believed committed the crime. Friendships became strained and in many cases, irretrievably broken. The town stood then and in many cases still stands divided. Want a date in 2015? They will be available for booking starting OCT 15! 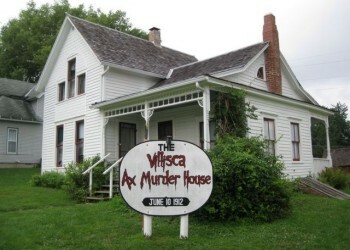 Overnights at the Villisca house typically begin at 4:00pm. After a walk-thru tour of the house and grounds, we will simply turn over the key and head on home. You will be asked to leave the key in a predetermined place when you leave no later then 9:30 am. Overnight tours are by reservation only and we suggest that you limit your group to ten or less. Any more than that and the small house gets even smaller. Bring your sleeping bags and pillows so you will be comfortable sleeping in the house. The barn is located a few feet from the house and has restroom, water, and electricity. If it's spring or early fall, a blanket and heavy coat are a good idea. Photographs, videotapes and audio recordings are encouraged, however, we would appreciate it if you'd share anything you may capture on film or tape. To book an overnight tour - call Martha at 712-621-1530 or email her at dmlinn@wildblue.net.